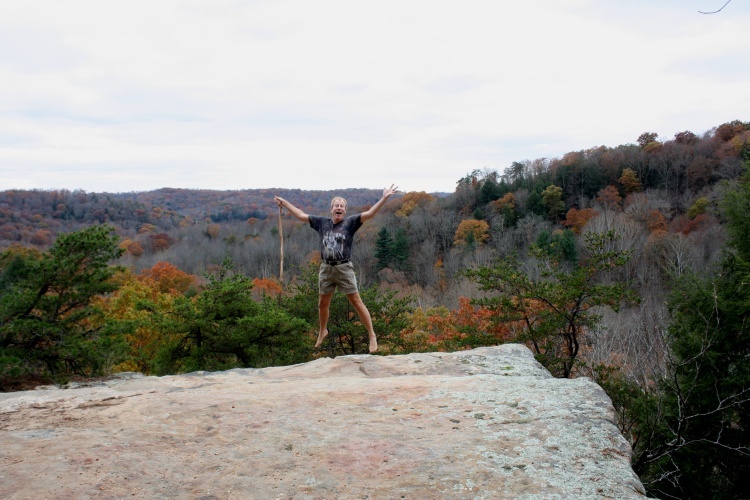 Yesterday was a perfect day for a hike down in Hocking Hills. It was decently cool (50°) but not uncomfortable, with a lot of leaves down so that the Blackhand sandstone and terrain could be seen, and there were still enough leaves to provide some nice color. 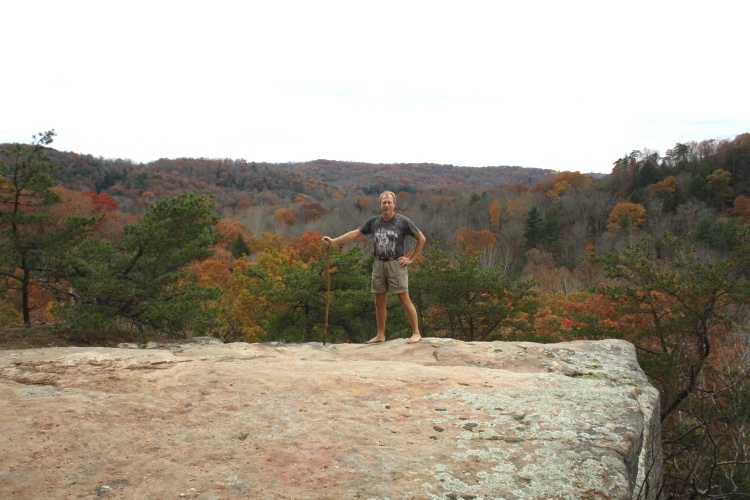 It was a perfect barefoot hike. I decided to visit Vulture Point and Airplane Rock, criss-crossing across Crane Hollow. (Note that this was in the State Forest portion of Crane Hollow, not the Nature Preserve portion, in which one needs a special permit to go.) I started out visiting the cave underneath Vulture Point. Here’s my approach. 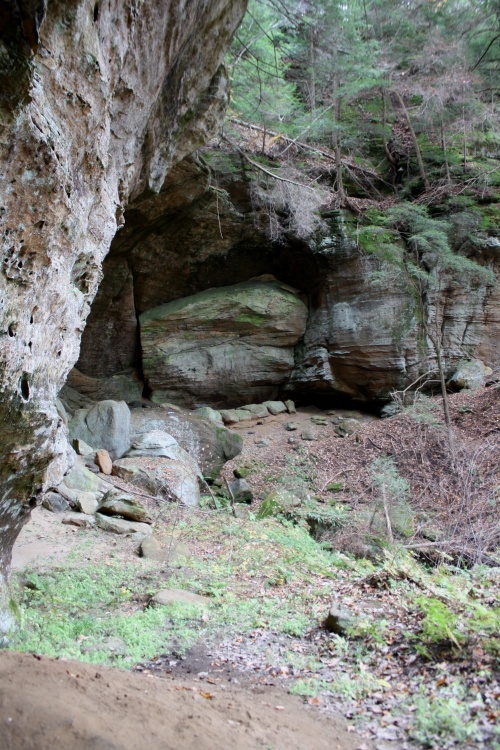 It’s fairly typical of the other recess caves in the area (although it is quite large, and has a fair number of huge slump rocks in it). Continuing my approach, in this picture I’m right beside the cave wall, and that rock in the distance is about 25 feet high, and has not fully separated from the back wall yet. People only come into this cave very rarely. That means that the soil has a chance to “relax”. 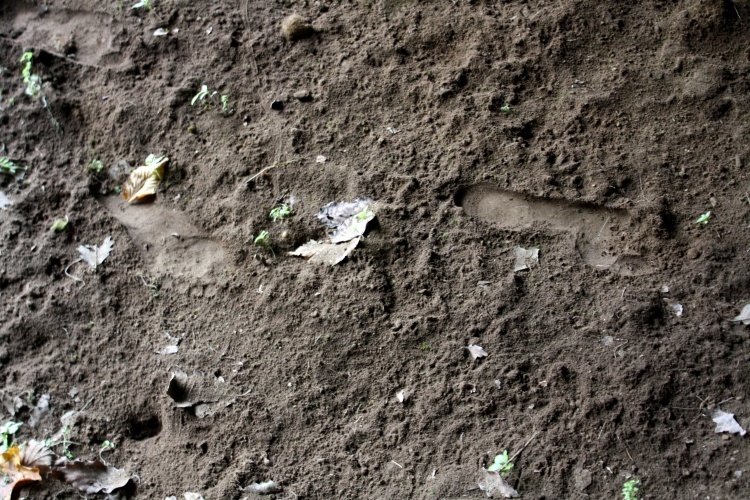 I suspect it is mainly moisture changes (and sometimes water drips from the ceiling) that expands and compresses the soil, removing signs of footprints. But that meant that my own footprints were eminently visible. 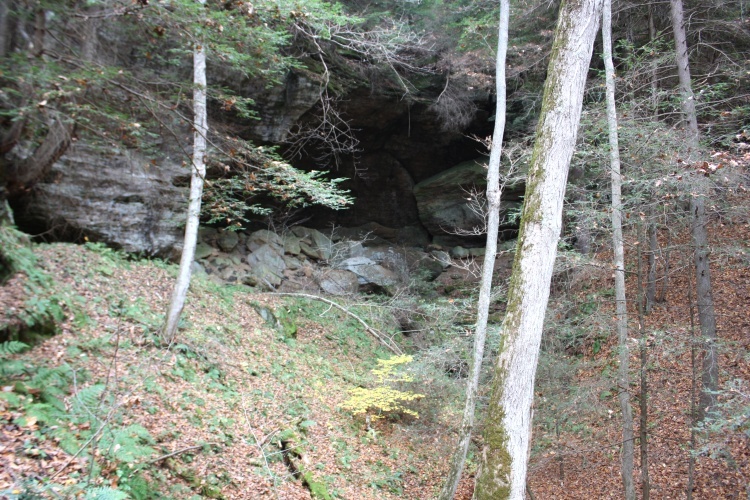 These caves also often have approaches that are quite steep. Here’s a shot from inside the cave looking out. You can see the angle formed by the rivulet bed. I then went by Vulture Point from below. You can see it from above in the Vulture Point and Airplane Rock blog entry, if interested. But from below, and from this particular, it looked a bit like a sphinx. People sometimes wonder if I don’t injure my feet. Well, messing around under Vulture Rock I did manage to injure myself. Here it is. I’m afraid that’s rather typical. (Not that I injure myself a lot.) 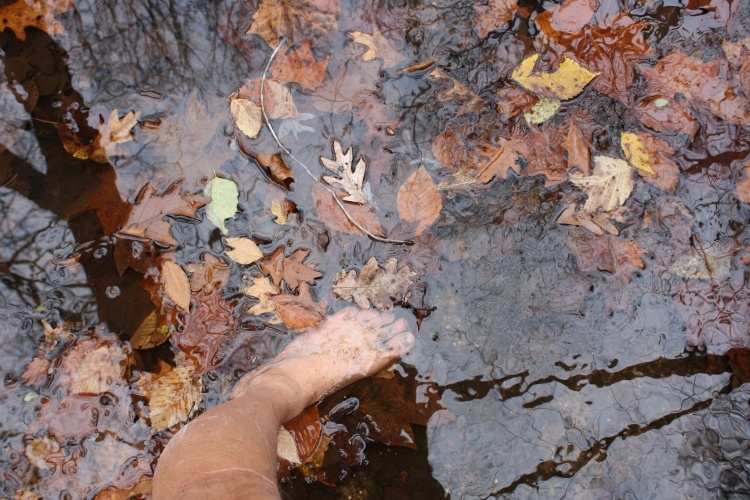 It’s just that, when exploring out in the woods, I am way more likely to zap some other part of my body before my feet. 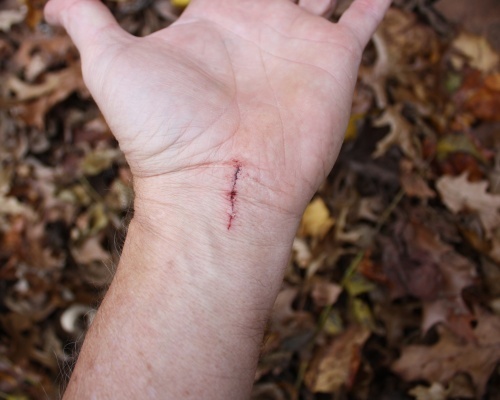 There are enough dead tree branches around that can attack any part of the body. From there I crossed over the creek that runs through Crane Hollow. It’s that time of year when dead leaves start filling up the creek. That’s gorgeous in its own right. Of course bare feet don’t mind the water at all, and the water temperature (particularly this time of year) is quite refreshing. 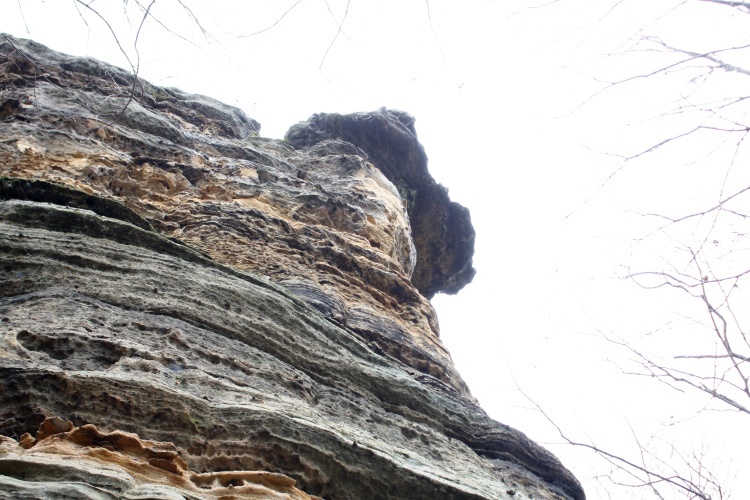 After crossing the hollow I ascended up to Airplane Rock (so called because the way it juts out looks like the nose of an airplane, if you look at it from the right direction). Up there I met four horse riders. 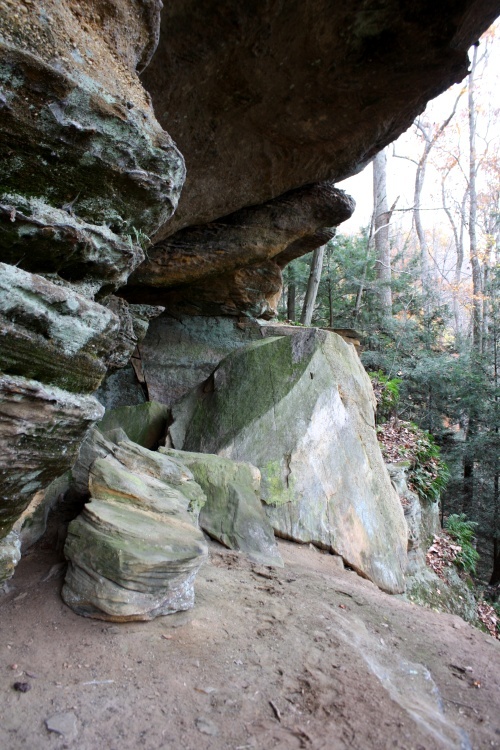 The Bridle Trail runs right by the approach to Airplane Rock and there are hitching posts nearby. I made sure that the riders knew about Vulture Point, which is just off another Bridle Trail across the hollow. Here’s a shot looking down the nose of the airplane. You can see the remaining color on the trees. By the way, in case you don’t recognize it, this is where the picture at the top of the blog was taken. In fact, in the picture above, the camera is sitting right where I’m standing in the banner picture. And what would a trip to Airplane Rock we worth without getting a silly picture there? From there I descended down the other side of Airplane Rock and crossed the hollow again, this time aiming for my “contemplative” spot. I discovered this the last time I was in the region. 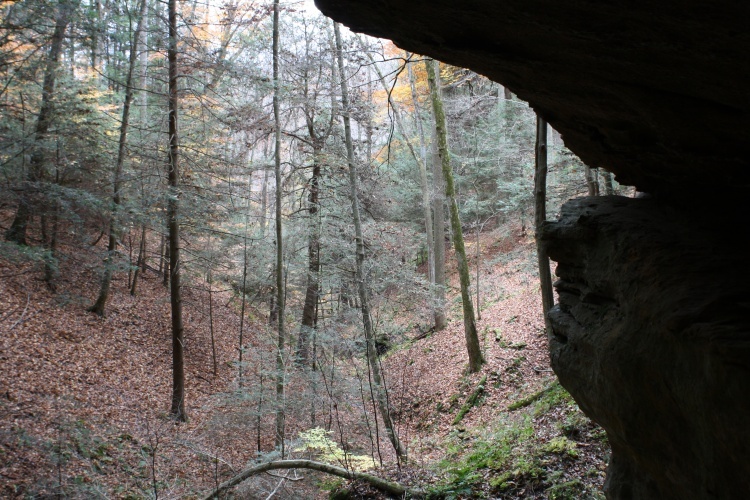 It’s a bit of a recess cave, but maybe it would better be described as just a platform above a 25-foot cliff, with a large rock overhang. Regardless, it is a pretty cool place, and perfect for contemplating the whichness of the why. You might be able to tell that there’s about a ten foot distance from the edge to the back wall there, so it is not a huge space. Oh, and the way I took the picture? Here’s the view from where I was lotusing. But it is a really nice place. 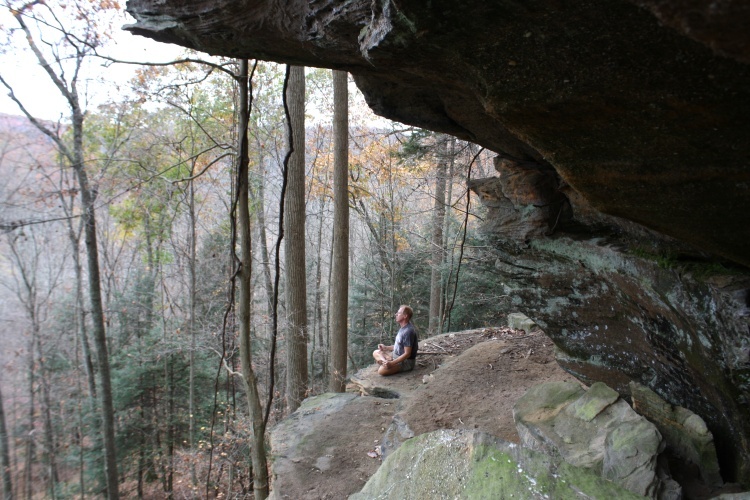 Just another of the hidden wonders of Hocking Hills. From there I finished heading all the way up to the top and rejoined the Bridal Trail up there . . . just about in time to join the four horse riders I’d met earlier. Of course (a horse is a horse) I’d taken the short cut, so it wasn’t too surprising. They’d managed to find Vulture Point and got quite a few nice pictures. From there I took the Bridal Trail to where is kisses the Conkle’s Hollow Trail, jumped over, and finished my hike on the rim trail there. Overall it was only about a 3-mile hike, and it took me a total of about 3 hours. But this one wasn’t a time-and-distance marathon. I had a lot of fun taking pictures and just lazing around soaking up nature on a nice fall afternoon.